Alexi Laiho is the frontman of Finnish melodic death metal superstars Children of Bodom, and the Alexi-600 Greeny is his most popular LTD Signature Series guitar. It's an offset V-shaped guitar with neck-thru-body construction. It pairs a comfortable alder body with a fast and smooth three-piece thin U-shaped maple neck, with an ebony fingerboard that features 24 extra-jumbo frets and green-tinted sawtooth triangle inlays. The Alexi-600 Greeny's aggressive sound is powered by a single EMG HZ F-H2 passive pickup. Other components include a Floyd Rose bridge and Grover tuners. 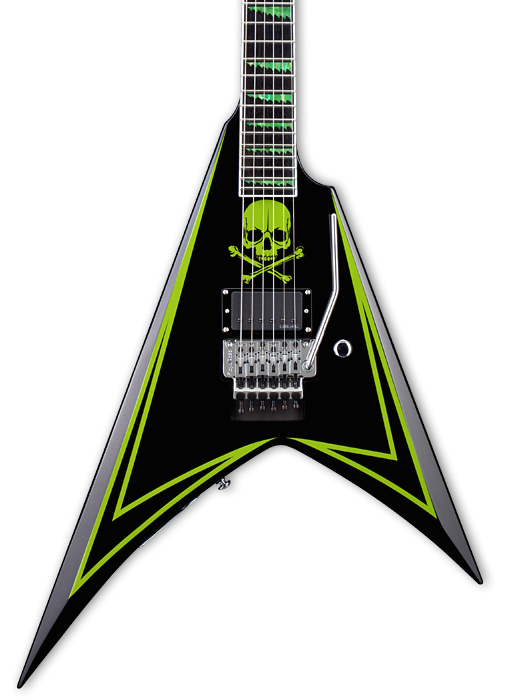 It comes in Black finish with lime green pinstriping and skull graphic. Hardshell Case Included.